Eligible Candidates can Download Exam Admit Card at the Official Website of UPSC. 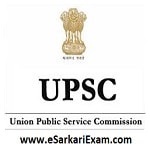 Select E Admit Card for Various Exams of UPSC. Open Link of Engineering Services Mains Exam 2018. Open E Admit Card Link. Download Admit Card by Using Reg. ID/ Roll No.